is often not just how much it will cost, but who will be paying for it! B. the employees each pay 100% themselves for their own massage time (usually somewhere between $1-$2 per minute). When the company pays the full bill, it definitely makes things a little more simple and straightforward, and the staff loves it because they don’t have to pay a dime! However not all companies have the budget to cover the full cost of the service on a regular basis, if ever. When the budget is not available, the company may alternatively seek to hire a massage therapist to come on-site and accept per-minute payments directly from employees. This sounds like a good idea in theory, but from the massage provider’s point of view it may not be practical. One main reason is because an hourly fee is not guaranteed, and the amount earned by the provider per visit will often be unpredictable. Also, the per-minute or per-session rates charged to employees may not be in their own personal budget, so the level of staff participation may be disappointing. There is however a third option that we might call a “hybrid” solution, which we have seen work effectively. In this hybrid scenario, the company will guarantee a predetermined fee to pay for all of the hours a therapist is on-site and available to provide massages to staff. At the same time, the staff will pay (in cash) a discounted/subsidized rate for their own mini massage sessions, either directly to a company manager or handed to the therapist. At the end of the day, whatever amount was collected in cash will be used to discount the full fee owed by the company. 3. The therapist/provider earns a predictable fee that makes their time spent on-site with your company profitable, and they look forward to coming back next time! If you have considered bringing in chair massage therapists as a benefit for your hard-working staff, but the budget does not allow for complete company sponsorship, this may be a good compromise option to try. 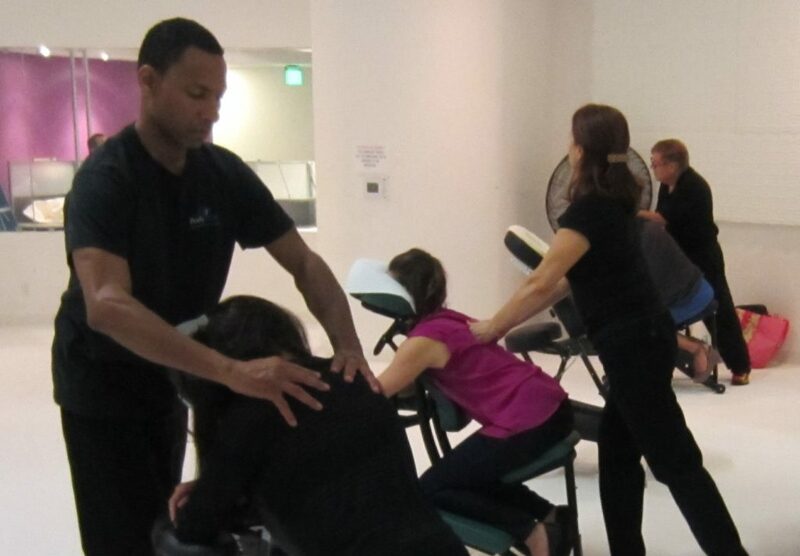 While not everyone wants a chair massage (whether they have to pay anything towards it or not) there are a number of people who are sure to take advantage of the opportunity, especially when offered at a reasonable, company-subsidized price. Visits can be arranged for as little as one hour, or up to several full days depending on the size of your staff. If you are interested in learning more about how this might work for your company please don’t hesitate to give us a call here at Body Well anytime!